Greek Independence Day commemorates the 1821 beginning of the biggest to that point and eventually successful uprising against the Ottoman Turks, culminating after many ups-and-downs (and the help of European sympathizers) in the establishment of an independent Greek state in 1829. Few people, however, focus on the fact that Northern Greece only became part of free Greece about 85 years later. 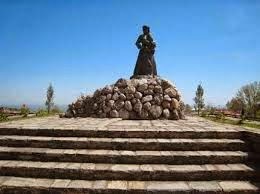 Much has been written about the Souliotisses of Northern Greece and the “Dance of Zalogo” (December, 1803): ..."rather than live with miserable dishonor as Turkish captives, the Souli women threw themselves off the same cliffs from which they had once thrown stones, standing out in history for their defiant martyrdom." (Greek Reporter 3-24-14). 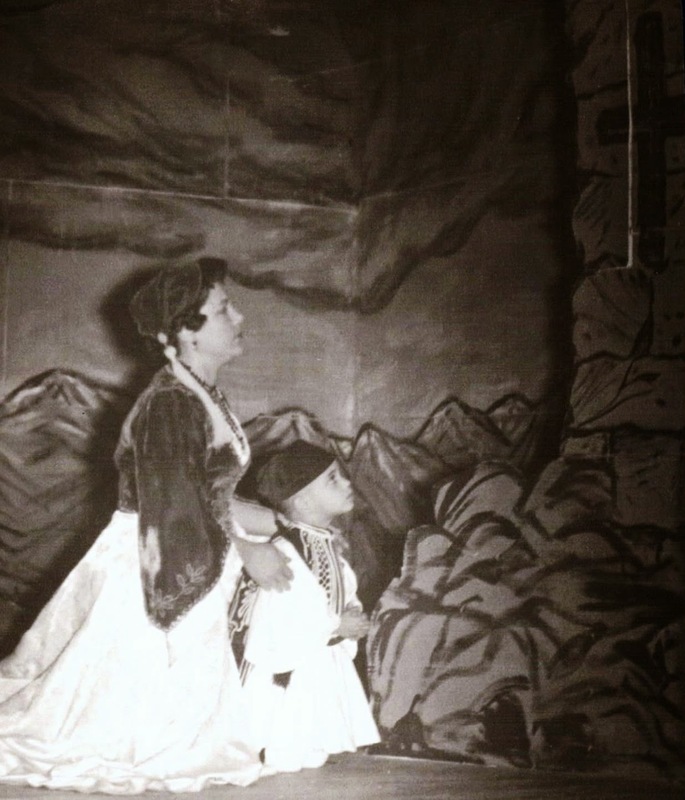 There are many other examples of bravery shown by women actively engaged in the struggle for freedom, including the women of my Dad's hometown of Naousa. The Revolution of 1821 did indeed engulf Naousa, but did not reap freedom for Macedonian Greeks at that time. A massacre shortly after Easter in 1822 laid the town to waste. Rather than be captured and/or killed by the Turks when fleeing rebel men left them behind, a number of women jumped over a cliff above the Arapitsa River. Today we celebrate the bravery of the many women North and South who contributed much over many years to Greek Independence -- OPA! Dawson, New Mexico threw me a curve! Thinking about visiting Santa Fe this summer, I remembered that my Aunt Katina (Huntalas) Skandale's husband George was from Dawson, New Mexico. George was a really nice guy and a good friend of my father's. 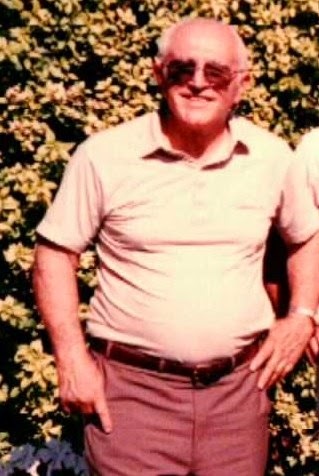 He passed away in 2009, and I had never discussed his hometown with him. I quietly marveled at the fact that any Greeks went to New Mexico in the first place. So I figured while in NM, I might go visit Dawson. Whoa!! Dawson, New Mexico is a certified ghost town -- formerly a mining town and the site of coal mining disasters in 1903, 1913 and 1923. 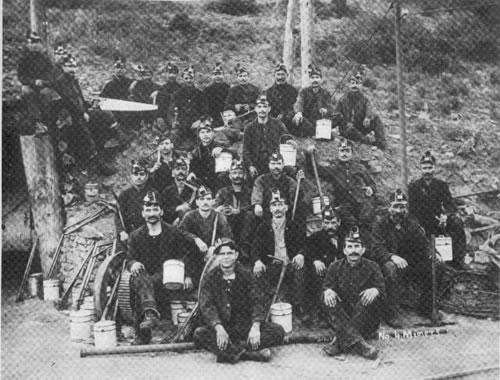 When coal went out of fashion, the Phelps Dodge Mine closed in 1950 and the town closed down, too. George Skandale was born in Dawson on January 9, 1918. His father Charles (Kyriakos) was from Crete and in the mine on that fateful day in 1923. But he used his ingenuity to walk out without injury 18 hours later as one of only 2 survivors. His brother Tony (Antonios) wasn't so lucky. The horror of that day affected Charles for the rest of his life; he never again went out of the house on February 8th. George was 5 years old at the time...He and his 2 siblings went to grammar and high school in Dawson -- an exceptionally well-developed mining town with a 3-story mercantile, churches, and numerous community amenities. Sister Sophia worked for the mining company at one point. All members of the Charles Skandale family eventually migrated to Southern California. Not one to forget his NM roots, George took his family to one of the Dawson Reunions many years later. What an amazing journey! P.S. You might know a Stockton Greek-American born in Dawson, NM. His name is Mel Bokides. When delving into the various photo albums located in the St. Basil's Church "Fireside Room" recently, I found a number of photos including my parents and other family members. 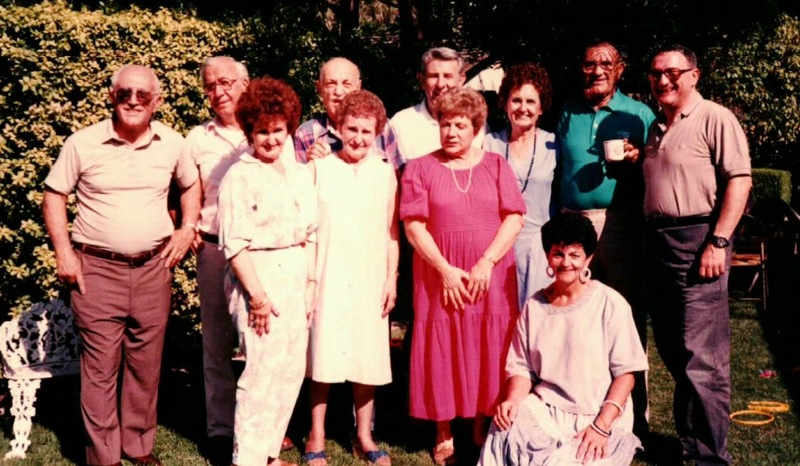 Through the years, we participated in many church/community activities -- not the least of which were AHEPA and Daughters of Penelope meetings and soirees. The simplest way to copy any of the photos in those albums was to take pics with my cellphone. Some of them came out a bit blurry, but I cherish them nonetheless. And it's both fun and interesting to compare them through the years. 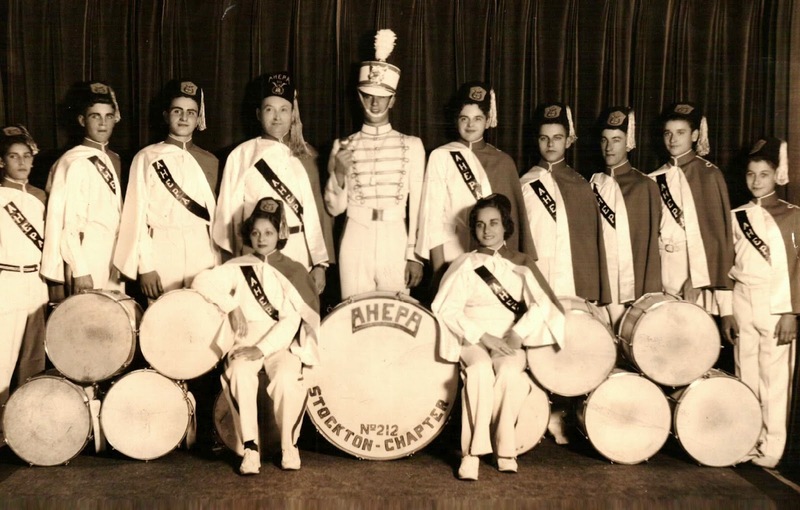 One that caught my eye especially was of former AHEPA Drum Corps Members. I remembered a photo I had at home of the Drum Corp back in the day, late 1930's, I think. There were 12 proud members of Stockton AHEPA Chapter No. 212. 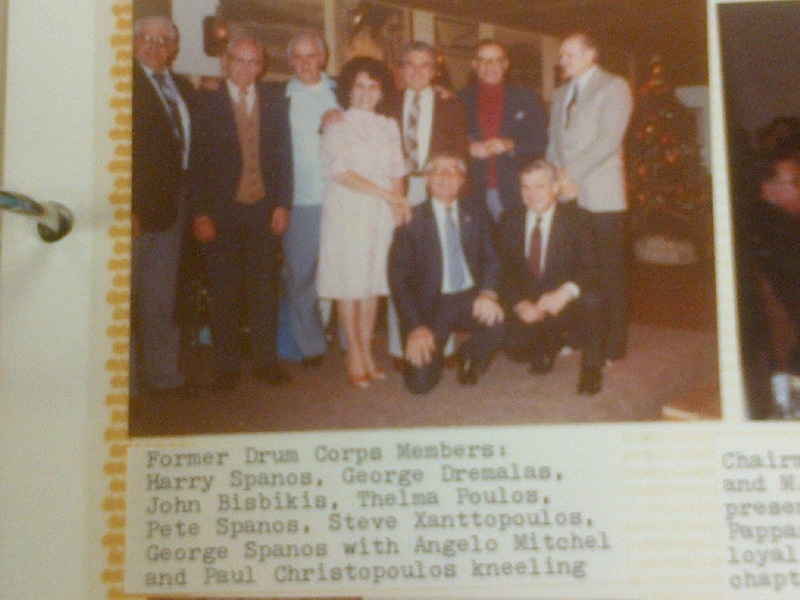 I recognize some, but not all: My dad Steve, George Dramalas, Harry Spanos, George Spanos, Angelo Mitchell. Who is that tall Drum Major? One of the women must beThelma Poulos. The other woman? Help!